This international story takes place in Mexico, Cuba, New York City, and Paris. The story follows Cecilia and Claudio through life as they struggle to find meaning and love. Claudio does it through a false sense of utter control and stability. He meets a wealthy middle-aged woman. Claudio loves her aloofness and calm until he discovers this has been created through medication. Cecilia finds it in the solitude of cemeteries. She majors in French literature and ends up in Paris to continue her studies. While in Paris Cecilia finally makes close friends and takes a lover who also finds meaning in visiting and exploring cemeteries. Through seemingly random story lines Cecilia and Claudio's paths cross and diverge. Nettel does not tell typical love stories. Her characters do not simply meet, overcome some obstacle, and fall in love. Her characters are more richly drawn and complicated. She shows all their foibles, quirks, and weaknesses. What keeps the reader mesmerized is that the characters don't know this. They think they are on the right path, doing the right thing until a twist of fate or life brings it all crashing down. Nettel's characters pick themselves up, rearrange the pieces of their lives and find a way to continue living. Readers will enjoy this book as it dissects the lives of these characters and then stitches them back together. Love and its loss leaves scars, and Nettel does not spare her characters. In the end their happiness is not found in what they believed themselves to be but in what they become after finally experiencing life with all its joys and sorrows. ‘If Vallejo's out there, he'll lead us to him. In all his existence as a poet he hasn't had a more dogged fan than Claudio. 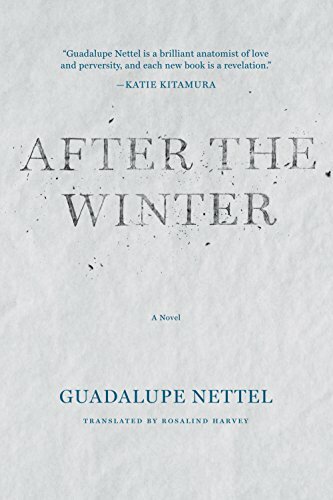 He's got to repay him for that kind of loyalty.’"
Guadalupe Nettel is a celebrated author earning the title of one of the most important Latin American writers under the age of 39 at the Bogota Hay Festival. Rosalind Harvey did an excellent job translating After the Winter from the original Spanish. She has captured the original intent in Spanish and seamlessly translated it into English. It is thanks to publishing companies like Coffee House Press that make novels like this unique love story available in English.